By Sean Jones: IBF middleweight champion Daniel Jacobs (35-2, 29 KOs) has a goal in mind to avenge his loss to Gennady Golovkin after he deals with WBA/WBC champion Saul Canelo Alvarez in their fight next month on May 4 on DAZN at the T-Mobile Arena in Las Vegas, Nevada. It annoys Jacobs to no end that he was beaten by former IB/WBA/WBC 160 lb champion Golovkin (38-1-1, 34 KO) by a close 12 round unanimous decision in their fight two years ago on March 18 in New York. Jacobs waited too long to get his offensive in gear, and he was unable to make up ground when he rallied hard in the second half of the fight. The judges scored the fight for GGG by the scores 114-113, 115-112 and 115-112. To this day, Jacobs maintains that he should have been given the decision. But in looking at the fight, Jacobs appeared to lose the first six rounds of the contest before he started coming on strong in the second half of the fight. Further, GGG dropped Jacobs in the fourth round. The knockdown proved to be the difference in the fight. “Victory would truly show the fans that whether you think I beat Golovkin or not,” Jacobs said. “I am the best Middleweight in the world. I’ve always said that I am the best, and I’ve also always been vocal that the win over Golovkin was taken from me. 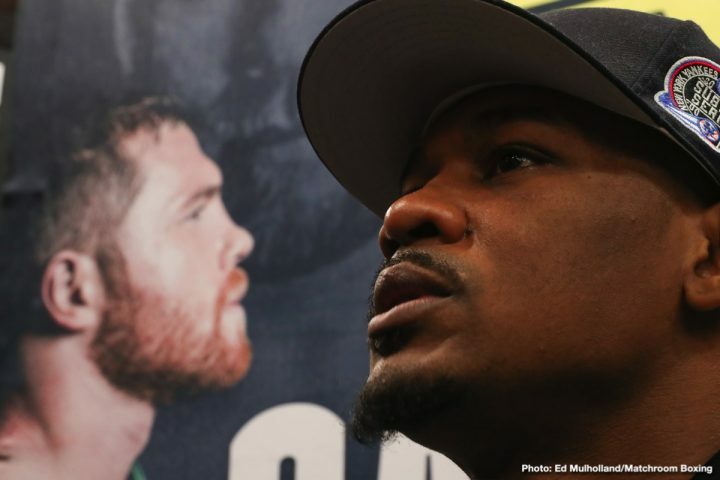 So, a win over Canelo puts a new idea in the fans’ minds that this guy is the best as he’s proven it against a guy that bean Golovkin – and then I can give Golovkin the rematch and prove that I am better than him,” Jacobs said. If Jacobs beats Canelo Alvarez next month, the Mexican star is going to want an immediate rematch with him without a doubt. Jacobs could throw a wrench in their plans for a rematch by insisting that he wants to fight GGG first, but the money that will be thrown at him for a second fight with Canelo will probably be too tempting for Jacobs to walk away from. Moreover, fighting Golovkin is a risky proposition for Jacobs. While Jacobs make think he deserved the win against GGG, that’s not the way the boxing public and judges saw it. Golovkin was the better fighter on the night, and that was with him basically boxing Danny instead of pressuring him. Golovkin will likely change that up in a second fight, and instead use the Dmitry Pirog blueprint to go after him to win rounds, and possibly stop him. The mistake Golovkin made in the Jacobs fight is the same one he made in his two fights with Canelo. Golovkin didn’t apply enough pressure, and he didn’t throw enough sustained combinations to win in a convincing manner. Canelo can’t handle fighters that throw a lot of punches. Jacobs struggled when GGG put him under pressure at times in the first six, and in the ninth round when he hurt him with an uppercut. “There are some controversial fights that he’s had that where I thought he lost, including both Golovkin fights,” Jacobs said. “I want to take his head off and prove that I am the best gladiator in the world,” said Jacobs about Canelo. That’s got to hurt Canelo that Jacobs thinks he lost both fights with GGG, but that’s what a lot of people believe as well. A lot of the boxing fans think the Nevada judges gave Canelo two wins over GGG based on his popularity. Jacobs didn’t mention the other controversial fights Canelo has been involved in, but he’s probably thinking about his wins over Austin Trout and Erislandy Lara. Both of those fights were matches that Canelo could have lost. Canelo only hit Lara with 31 head shots in their entire fight in 2014, but he was still given the win over him. Lara was hitting Canelo with jabs the entire night, but the judges were for some reason ignoring those, and scoring the rounds based on Canelo landing one or two head shots per round. In other words, it was the same thing that we saw in the first fight between GGG and Canelo in 2017. Golovkin was dominating the fight from the outside using his power jab, and Canelo was only able to land a couple of good shots each round. The judges ended up putting more weight on Canelo’s one or two power shots in each round, and ignoring all the jabs he was getting hit with. Jacobs is concerned with how hard it is to land cleanly to the head of Canelo due to his upper body and head movement he uses. However, he notes that Canelo doesn’t move well around the ring, isn’t good at cutting off the ring like Golovkin due to his knee problems. It’s not just knee problems that causes Canelo problems in moving around the ring. He has short, thin legs that are forced to carry his huge upper body. Canelo’s legs are out of proportion with his huge upper body. Canelo’s slender Babe Ruth-like legs look like they’re made for a thin person with muscles. It’s not surprising that Canelo is starting to have knee problems. Jacobs wants to use his size, and mobility to get the better of Canelo if he finds it difficult to connect with head shots in the fight. It’s believed that Canelo will attempt to walk Jacobs down like he did in his last two fights against Golovkin and Rocky Fielding. Canelo had success in both of those fights in coming forward to land his power shots to the head and body. Fielding wilted from the body shots Canelo was hitting him with in getting stopped in the third round on December 15 at Madison Square Garden in New York. Golovkin stood his ground in the center of the ring, but he gave up a lot of rounds in the first half of the fight when he wasn’t fighting aggressively enough. Jacobs doubts Canelo will be able to bully him due to him being the smaller fighter. Jacobs needs to make sure he fights very hard to win the the majority of the first six rounds of the fight, because those are the key rounds where Canelo AlWAYS at his best. Canelo gasses out in the second half of his fights, so he puts himself in position to win his fights by getting the better of his opponents in the first half of the fights. If nothing else, Jacobs needs to try and win the majority of the first six rounds, and then completely take over the fight in the second half of the contest when Canelo gasses. Additionally, it’ll be important for Jacobs to make sure he wins the 12th round convincingly, because that’s when Canelo finds energy to try and win the fight. In both fights with GGG, Canelo faded badly after the sixth, and struggled until the twelfth. At that point, Canelo came alive and was able to win those rounds to salvage a draw in the first fight and a controversial 12 round majority decision in the second fight last September at the T-Mobile Arena in Las Vegas.